Large numbers of Palestinian police have deployed in the Gaza Strip, after a show of strength by a rival force set up by the Hamas-led government. Palestinian leader Mahmoud Abbas sent the police to restore order, security officials said. The deployment is being described as the largest since Israel's pullout from the territory last year. Hours earlier Interior Minister Said Siyam declared a 3,000-strong Hamas-led force operational. 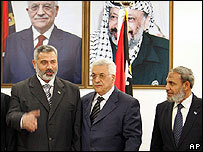 The move is in defiance of a veto by Mr Abbas and heightens tensions between his Fatah party and the Hamas-led government. The new force includes some members from Hamas' military wing and others from existing security forces. Its role will be to ensure the safety of citizens and protect property amid a wave of instability and violence. "The weakness of security forces is clear to everyone," Said Siyam said. "There is stealing, kidnapping and killing, so there is a real need for this force," he told a news conference in Gaza. Since Hamas won the parliamentary election in January, the movement has been jostling with the president for control of the many competing branches of the Palestinian security forces, says the BBC's James Reynolds in Jerusalem. Hamas officials announced the creation of the new force in April, after Mr Abbas appointed one of his supporters to lead the most important of the three branches of the security services that report to the interior ministry. The unit will be led by Jamal Abu Samhadana, a militant who is wanted by Israel.